Omnivorous leafroller (Platynota stultana) is primarily a pest of peaches in the San Joaquin Valley. It occurs in the Sacramento Valley, but seldom causes damage. Omnivorous leafroller overwinters as immature larvae in mummy fruit and does not enter dormancy. Larvae are light colored with dark brown or black heads. When mature they are about 0.6 inch (1.5 cm) long and have two slightly raised, oblong whitish spots on the upper surface of each abdominal segment. Abdominal segments may have a greenish brown tinge. They pupate inside a webbed shelter. Adults (see photo above) of the overwintering generation emerge in March. 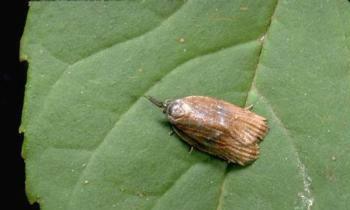 They are small, dark brown moths, 0.5 to 0.375 inch (9-12 mm) long with a dark band on the wing and a long snout. Eggs are laid in overlapping rows that resemble fish scales. The first generation of eggs usually is laid on weed hosts, and adults from this generation emerge in May or June to lay eggs in orchards on leaves and fruit. Larvae that hatch from this generation of eggs can cause significant damage in stone fruits. All have the characteristic behavior of wriggling backward when disturbed and dropping from a silk thread attached to the leaf or fruit surface.